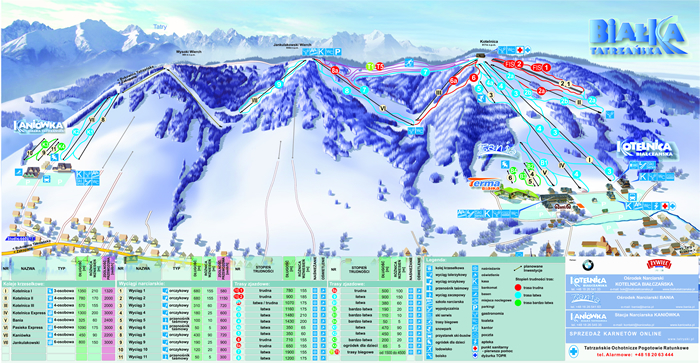 First of all it's important to note that the ski areas in Zakopane are all independently owned and run and thus there are seperate lift passes for each area. Individually the areas are certainly not anywhere near the size of the gigantic, interlinked areas that you can find in the 3 Valleys, France or Whistler-Blackcomb, Canada. 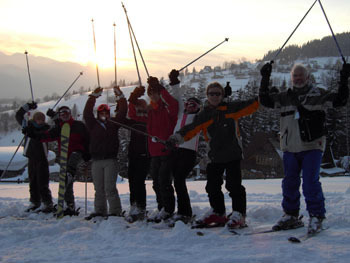 Having said this, once combined, which is easily possible to do by visiting a different slope each day, the total number of lifts, runs and variety of slopes is certainly more than enough to firstly and most importantly improve to and beyond instructor standard and secondly to have a very fun time without getting bored. 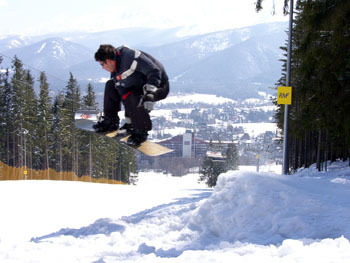 Of course the most obvious benefit of the skiing and snowboarding in Zakopane is the price- there is no way that you'd ever be able to get away with a £10- £20 lift pass ALL DAY in the established resorts in France, Italy, Switzerland, Austria or North America. 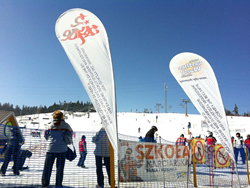 Another awesome advantage in Zakopane is that you can ski on certain areas- notably Bialka Tatzanska, one of the most varied resorts, from 9am until 10pm EVERY SINGLE DAY of the season which can often last from late November until Mid to late April (snow permitting of course). 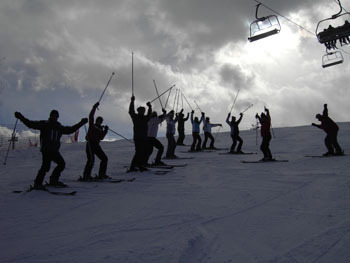 An all day unlimited pass at Bialka costing just 70zl you can't go far wrong. Also the fact that from 4pm onwards the slopes become much quieter meaning that even in peak season it is possible for keen sportspeople to get in plenty of quality runs without having to queue too much as long as you choose your times on the slopes wisely. One of the hardest things to organise is often the transport to and from the slopes (which is included in all our "all inclusive" packages). Booking taxis or minibusses can prove very difficult if travelling independently and prices can and will vary wildly depending on your driver. There are public transport options to some of the areas although again information and logistics regarding this solution is very hard unless you are good at speaking Polish. 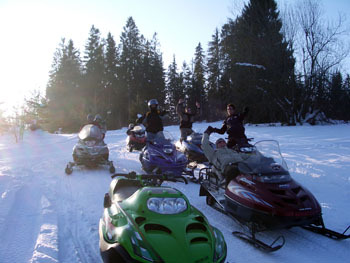 Snowmobiling is easily accessible at Bialka Tatrzanska ski area as little as 30 minutes from Zakopane (traffic permitting). 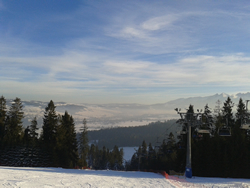 One of the best all round ski and snowboard areas. 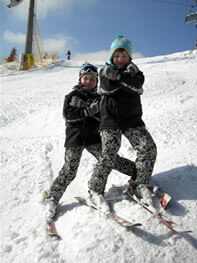 Bialka has recently started to grow and take its ski area to a much more professional level. 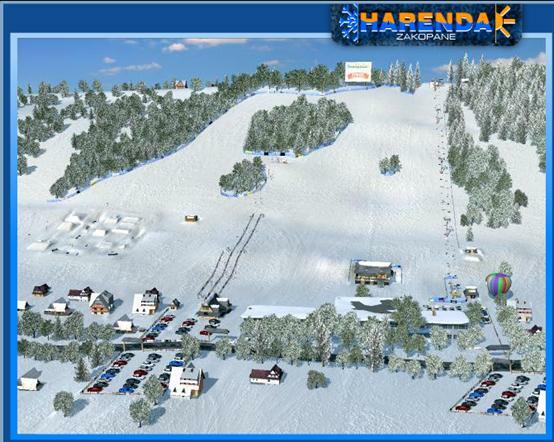 New to the season 2014/15 there was a new ski lift and run. 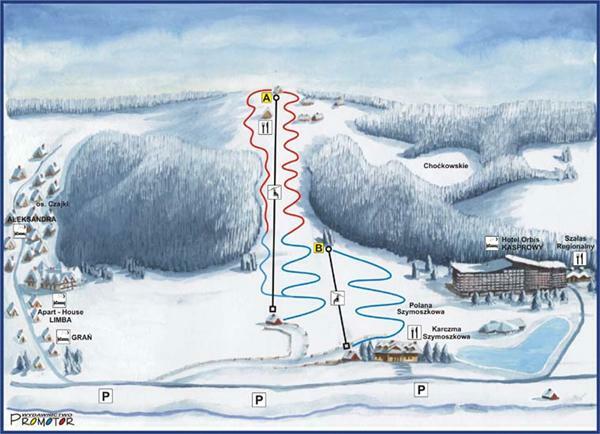 There is also a brand new lift and run that has just opened (April 2015) which links to the Kaniowka ski area. 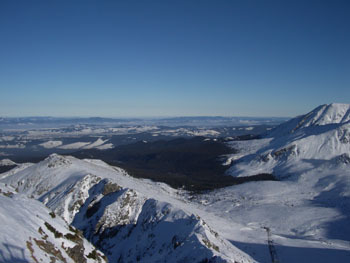 Each season a new snow park sponsored by Burton snowboard company or similar is built. At the bottom of Bialka they have created a snow tubing zone (large rubber rings that you sit on and slide down a track in) which is included on your lift pass for the little ones where they get dragged up the hill in a rubber ring by a little lift and then slide down a designated course like a little bobsled run. 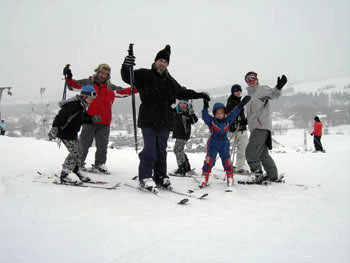 If you are a first time skier or snowboarder then there are 3 wide beginner areas served by I draglift, 1 magic carpet and a 4-person chair lift. 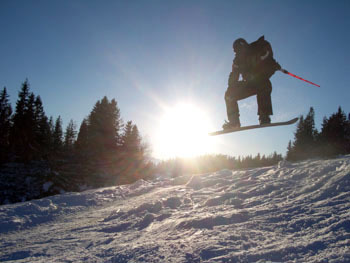 If you are more an intermediate skier or snowboarder then there are long and wide runs perfect for practicing those turns, which is served by 4 high speed detachable 6-person chair lifts. However, if you fancy yourself as a bit of an expert then there are 2 chair lifts and 2 drag lifts at the top or the first 6 man lift with a choice of steeper runs. The drive to Bialka takes about 30 minutes (can be more or less than this depending on traffic) but once you are there it is fully equipped to keep you entertained even if you do not want to ski. There are a selection of good and comparatively cheap restaurants and bars with a large decked area at the top and bottom of each lift. 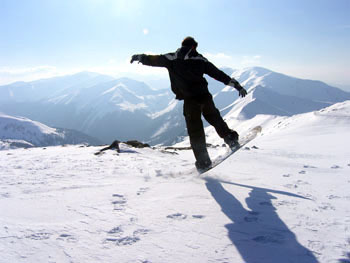 There is not only the wonderful view of the Tatra mountain range but a designated sledging area, restaurants, cafes, bars, games rooms, ski shops and even a local market. Photos above: SW group at Bialka Tatrzanska, Alan posing somewhat and Batman and Yoda in the Bialka car park. All prices are Sunshine World LTDs prices. We reserve the right to change our prices. Your confirmation invoice price will not change. Photos: The views from the top of Kasprowy Wierch on a clear are arguably as good as any of the most famous resorts in the world. 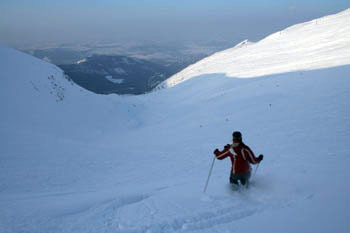 Kasprowy Wierch is located high in the middle of the Tatra Mountains, 1987m above sea level it is the biggest and most challenging ski area in Poland. 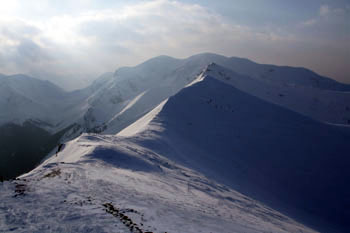 Not only does it offer superb skiing and snowboarding but spectacular scenery as you are in the heart of the Tatra Mountains. From the bottom of Kasprowy, Kuznice, the brand new Aerial Cable Ropeway, capable of carrying 60 people at a time will take you to the top of Kasprowy in less than 15 minutes. 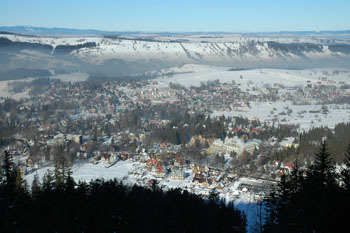 From the top you can ski in either of 2 valleys, to the left in the Gasienicowa valley and to the right the Goryczkowa valley. 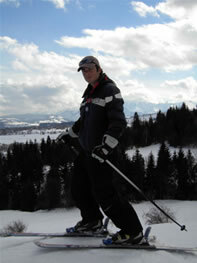 Each valley is served by a chair lift operating between 9am and 2.45pm - 4.45pm (depending on the time of season). At the top of the cable car there is a large restaurant and snack bars. At the end of the day you can take the cable car back to Kuznice or ski all the way down the 6km long Goryczkowa valley, past the bottom of the chair lift and onto a long winding run that leads you back to Kuznice. 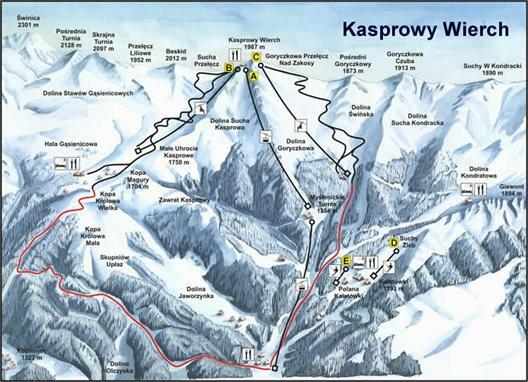 New in 2009 Kasprowy Wierch hosted Zakopane's first Red Bull "Zjazd Na Kreche" (Translation- Straight to the Base") race with over 226 male and female skiiers and snowboarders all starting at the SAME TIME down the 6km long extreme slopes from the top! Kasprowy has hosted many international competitions throughout the last 70+ years and is gradually coming back onto the international scene as it's facilities are upgraded year on year. 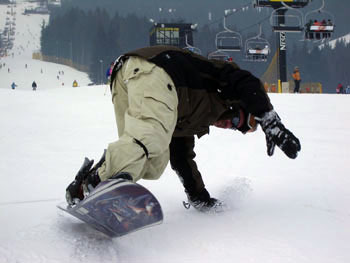 Hopefully the attitude towards skiing and snowboarding in Poland's favorite National Park will become more reasonable in the near future. 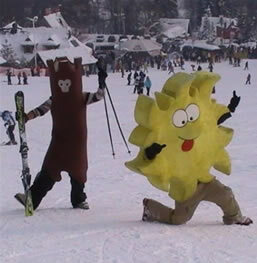 The general attitude of the last few years does seem to be swinging more in favour of sport and less of unneccessary protectionism of what has so far only seemed to be to "protect the trees from skis and snowboards" which can't possibly cause any real damage to them! Again the main benefit on Kasprowy is that you can Pay as you Go which while at first it appears to be inconvenient (it is a little inconvenient after all!) It does mean that you can genuinely relax and enjoy a long lunch or Coffee/ mulled wine break without feeling like you SHOULD be maximising your 50 Euro/ $100 Canadian Dollar Day pass on the slopes. A full day pass on Kasprowy - (2015) is 138PLN/ about £25. You can buy single runs for about £4 per time. This is a great option if you are just looking for a relaxed few runs. Also, while there are often queues for the main cable car (mainly "pedestrians" who are sightseeing Poland's most famous peaks), the non skiiers/ boarders are not allowed up after 2.30pm which means a lie in or start of the day on another area can easily be followed by a queue-free trip up Kasprowy for a good couple of hours of blasting! 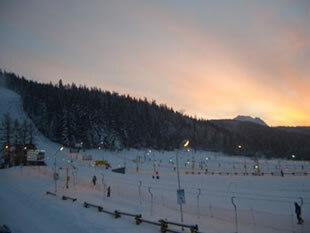 If you get up early you can also avoid the queues by getting to the base at 8am if you're very keen. 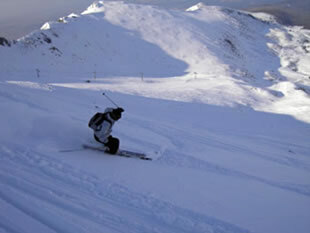 for 6 nights stay –From just £225 per person! Harenda also has probably the least expensive altitude cafe in the world with a pint of beer at the little hut at the top costing just 6zl in 2015 (£1!) and wonderful views to go with it. 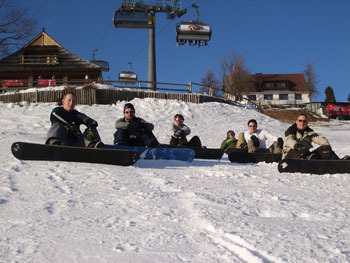 Left: Some SW snowboarding guests chilling on the slopes at Szymoszkowa. 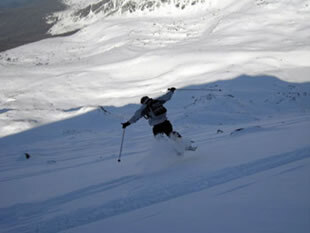 for 6 nights stay – From Just £225 per person! 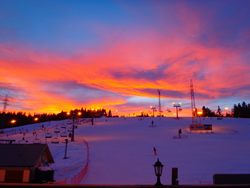 Photos: left- view from the top of Nosal ski area, Right- Sunset at Nosal and the floodlights fire up. Nosal is certainly not the best area for intermediate skiers/ snowboarders looking to cruise around on long blue-graded slopes but for this standard of skier/ rider Nosal is a good option for a first day back on the slopes if you're feeling like a nice, easy area to get your legs back in sliding mode.